Are the kids complaining they’re bored? 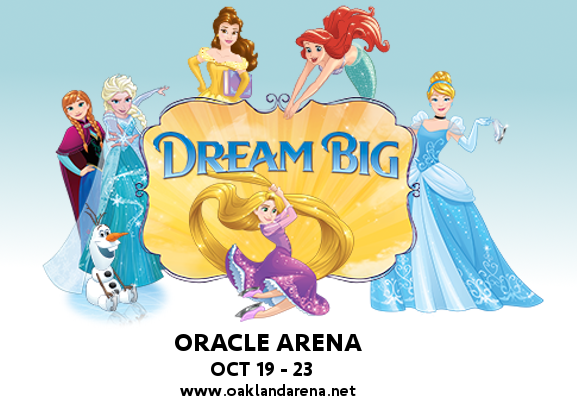 Treat them and yourself with a magical escape from the mundance to the magical world of Disney On Ice: Dream Big at Oracle Arena on Thursday 19th October 2017! A Disney On Ice special focused on the Disney princesses, Field Entertainment present a show that kids and grown-ups of all ages will adore! Early booking recommended – get your Disney On Ice: Dream Big tickets today!! Featuring the main characters from Frozen, Cinderella, Sleeping Beauty, The Princess And The Frog, Aladdin and more, the stories you know and love come alive thanks to an incredible cast of more than sixty skaters with all the songs you know and love combined with truly spellbinding choreography! Don’t delay – get your Disney On Ice: Dream Big tickets NOW!